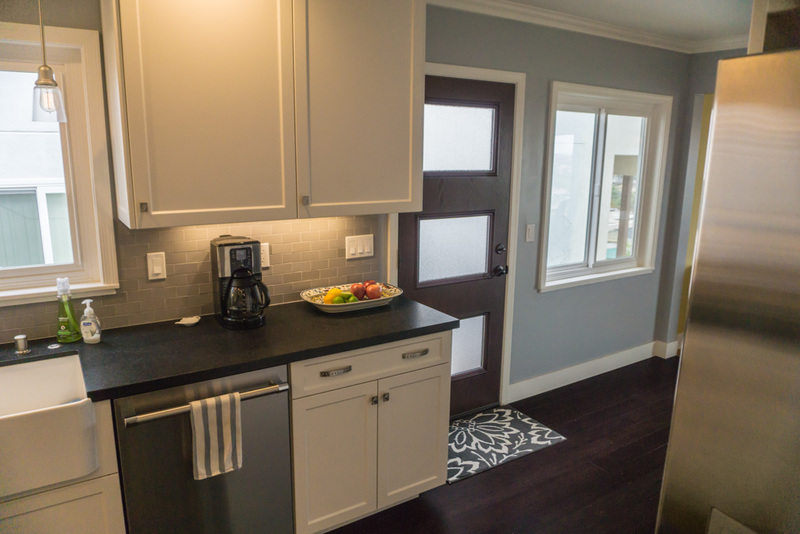 Change ¾ bath into powder room adding the old shower and closet space to the kitchen main area to enlarge the kitchen. 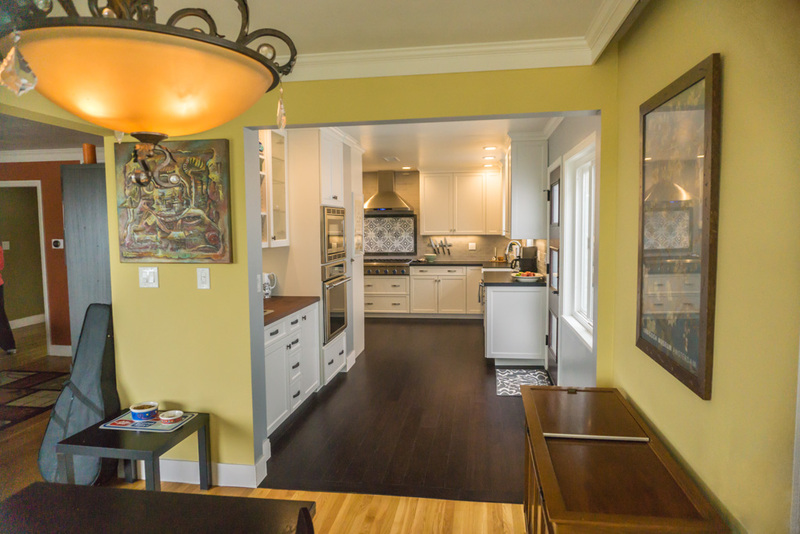 Raised exposed beam to hide in ceiling between main kitchen and new baking area section of kitchen. 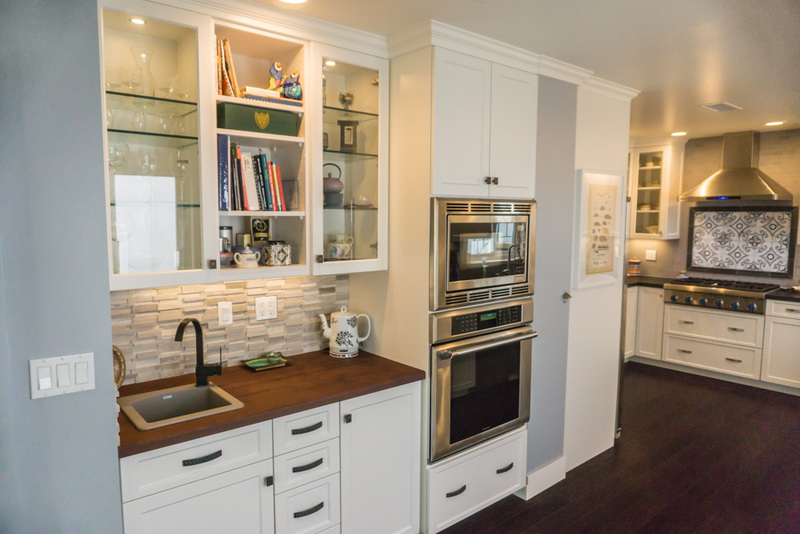 This homeowners primary issue was finding a way to enlarge the 1930’s kitchen in their home and open it up more to the dining area. 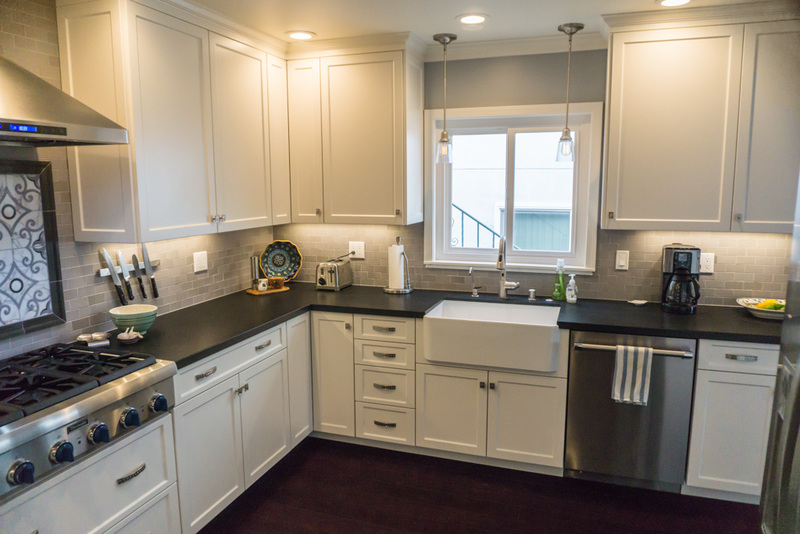 The home was a 2 bedroom 1 and ¾ bath home with a full detached basement (not connected by interior stairs) containing another ¾ bath, laundry, and potential living space or bedroom that we remodeled a year after this kitchen project. 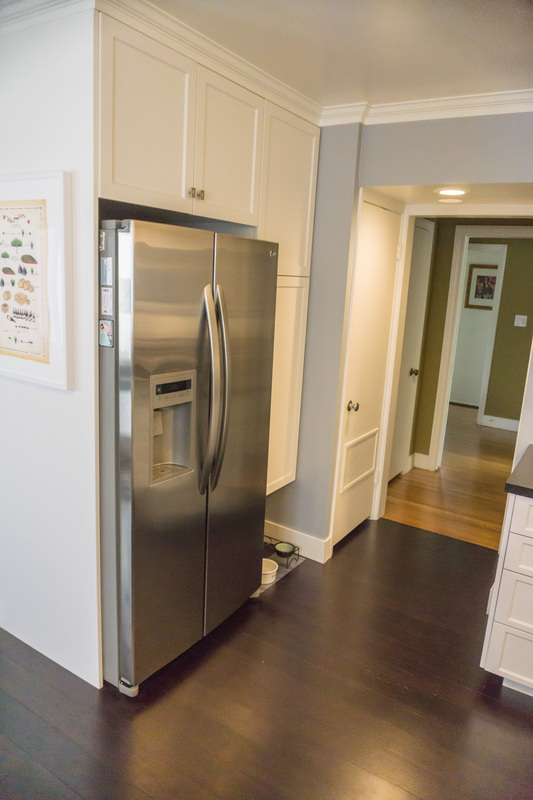 We were able to widen the kitchen space by stealing the old closet and shower space from the ¾ bath and a hall closet. 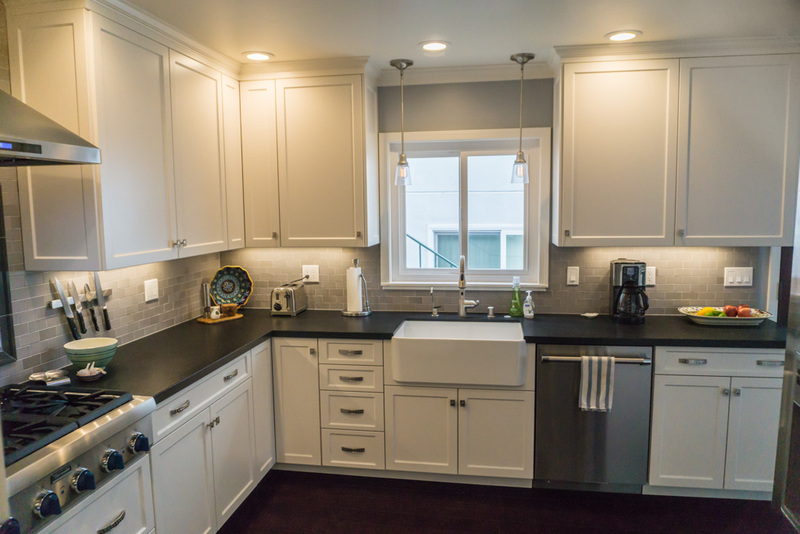 That 3/4 bath became a powder room with sink and toilet only. 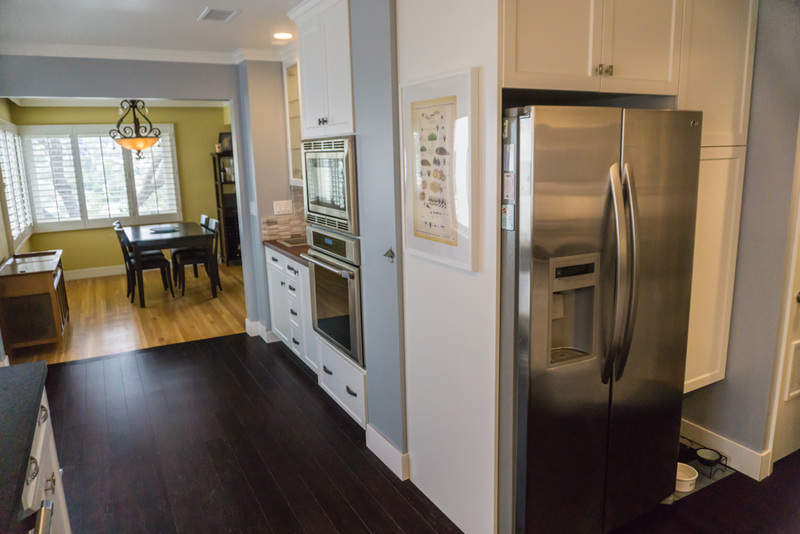 We also eliminated a single doorway between the kitchen and dining room by installing a large almost whole-wall passageway. 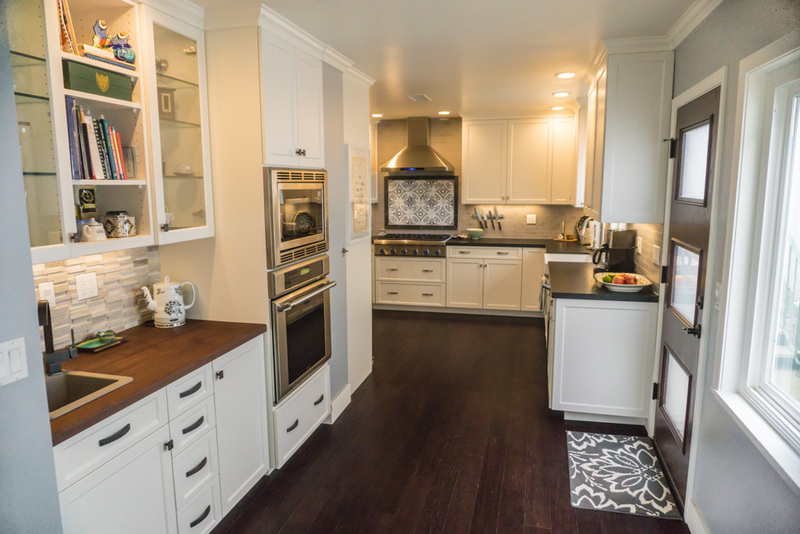 The main work area of the kitchen with the sink, cooktop, and fridge was now a very ample size with plenty of countertop space and abundant storage. 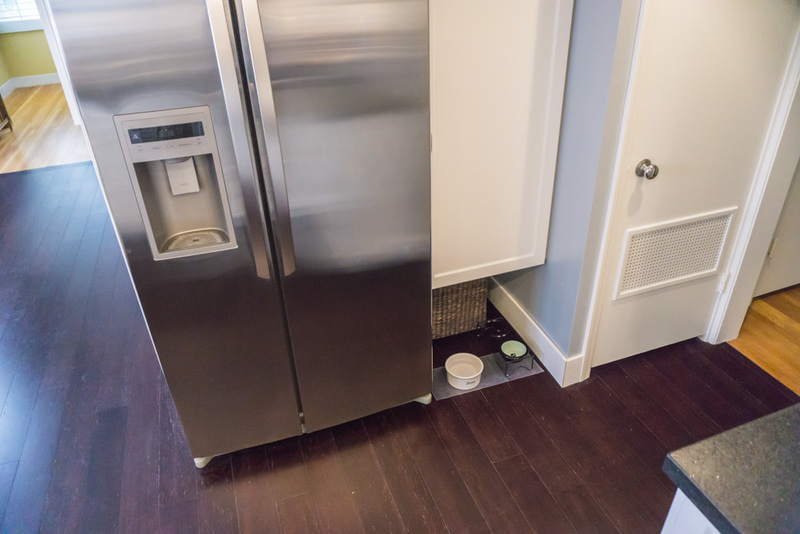 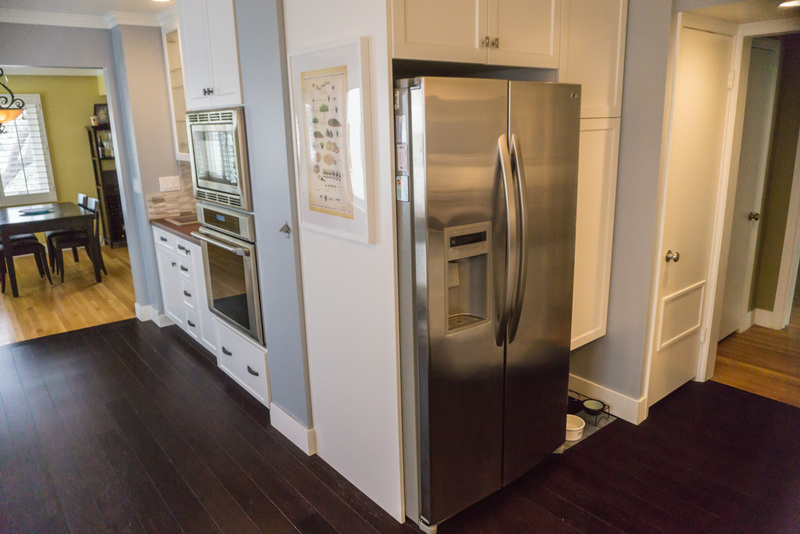 The fridge and pantry area was custom configured to allow a pet food and water station to be tucked under the pantry, out of the way to prevent people from accidentally kicking it as they walked in the room. 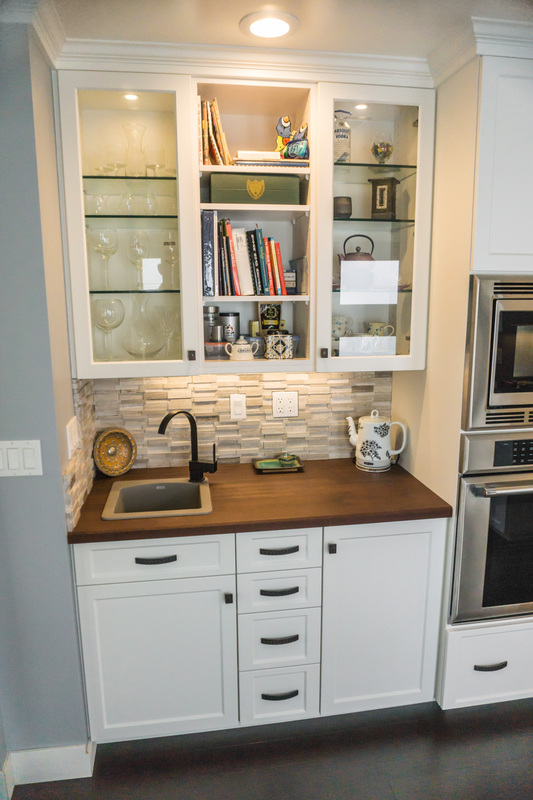 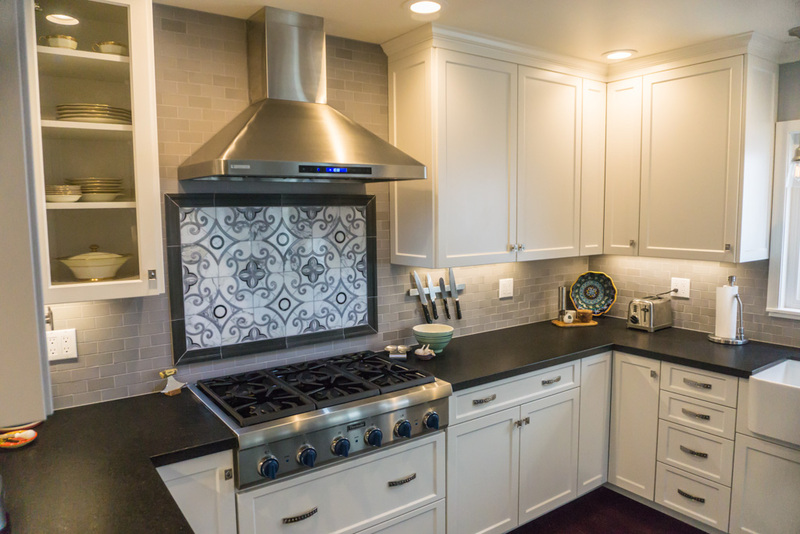 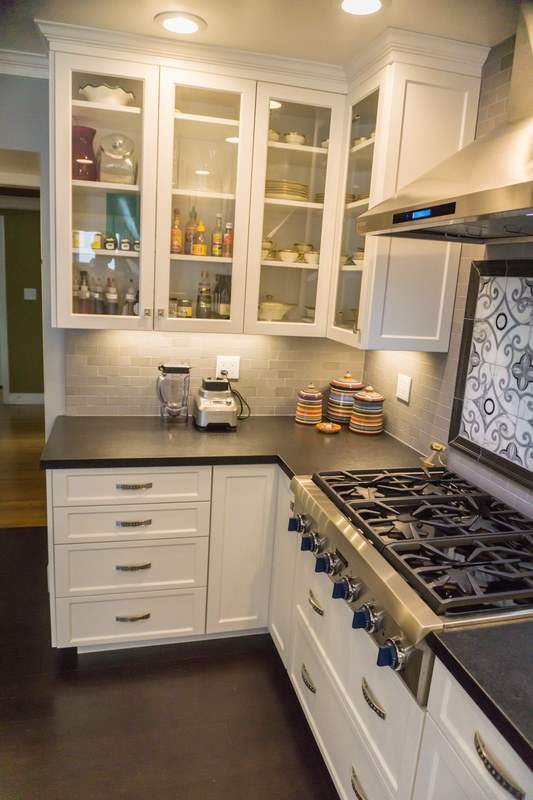 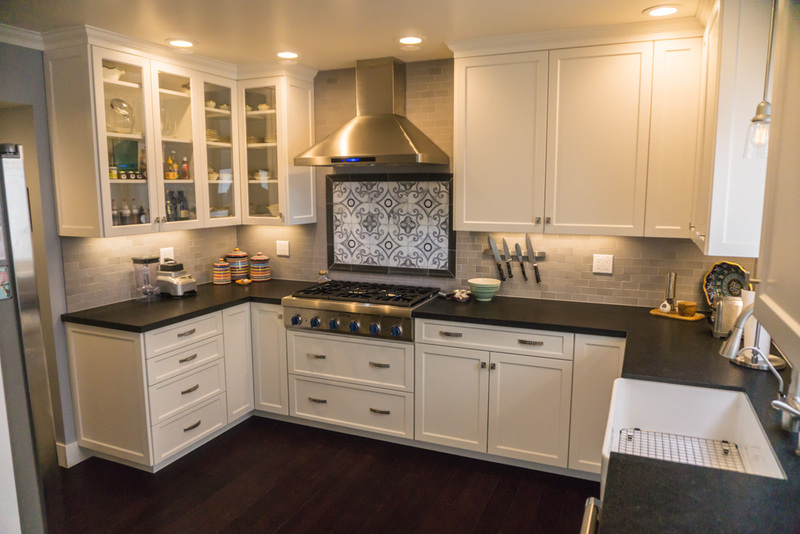 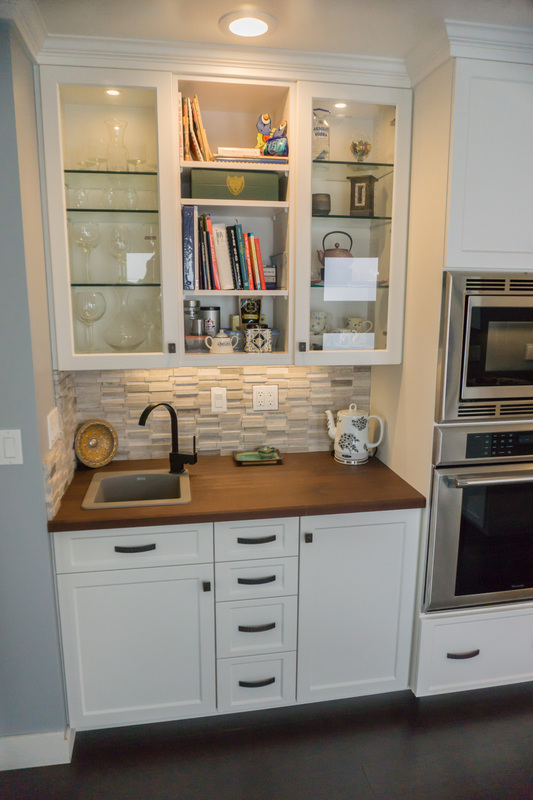 Custom made subway tiles were used for the backsplash above the granite countertops, and a polished marble tile mural was installed over the cooktop. 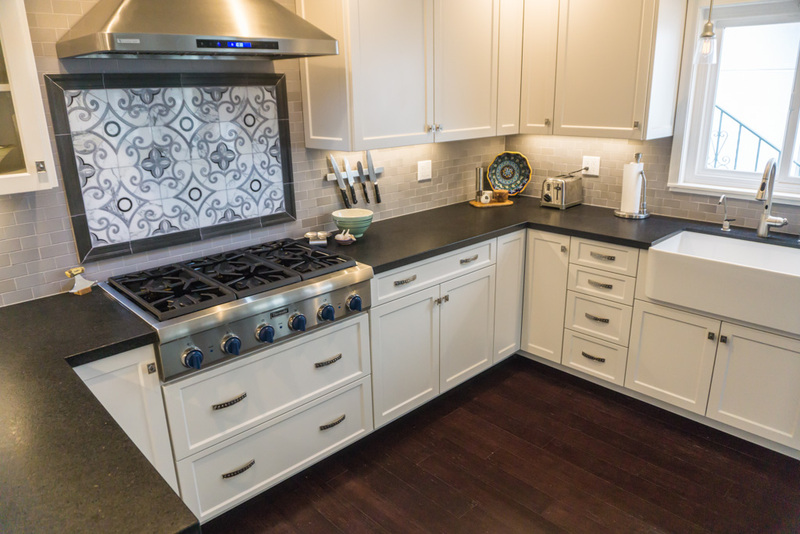 These material choices, the farmhouse style sink, and the white thermofoil cabinetry give this kitchen the transitional look the client was looking for. 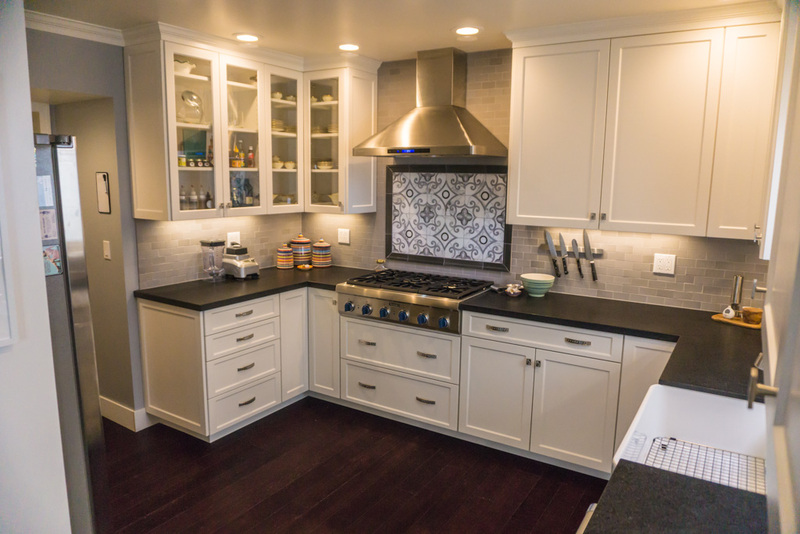 The latest energy efficient lighting with LED ceiling cans and LED under cabinet lights all on dimmer switches. 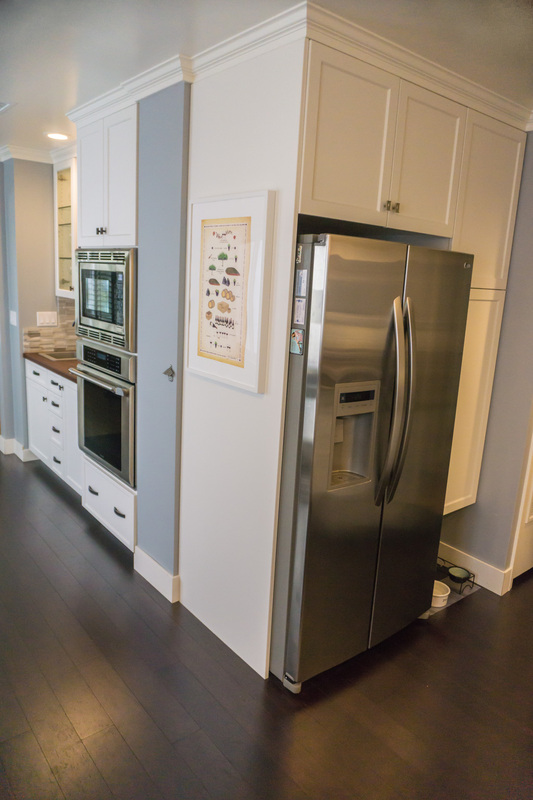 The awkward leg of the room which connects to the dining room was converted into a baking center with the wall oven, prep sink, storage/ display cabinets, and a pull-up mixer shelf. 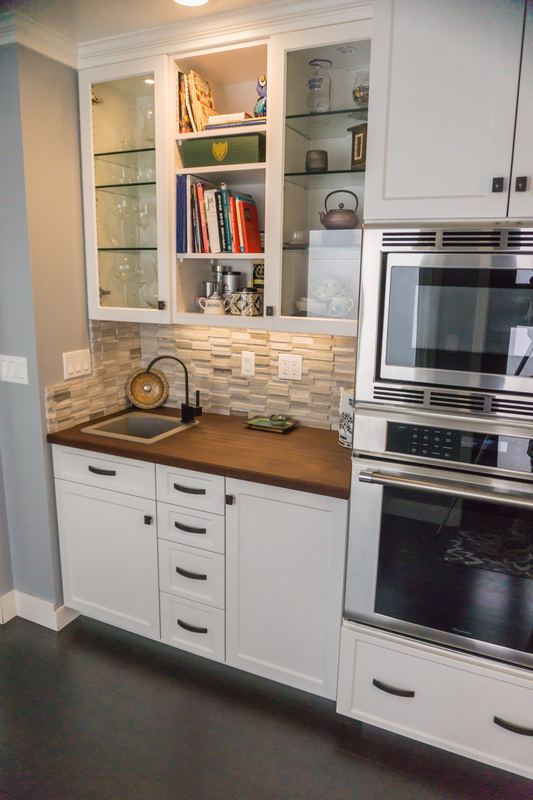 The client wisely chose to make this area distinctly different from the main kitchen by using a natural wood countertop made of ¼” sawn solid Sapele wood with a tung oil finish and a honed staggered natural stone backsplash. 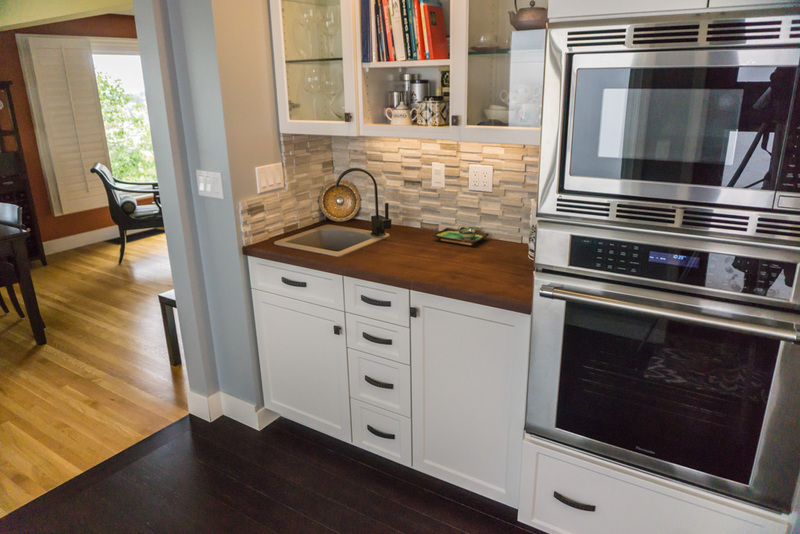 The textural qualities of these materials really make this area unique and stand out. 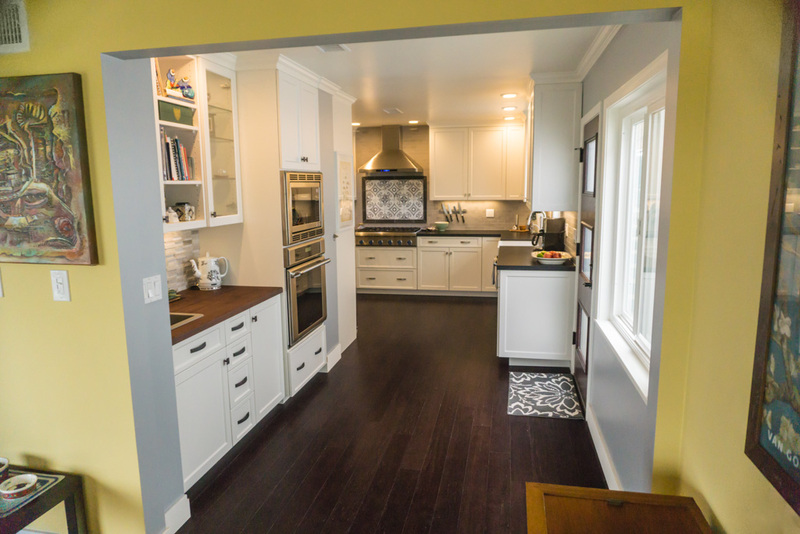 Removing the old soffits and beam while raising the cabinets to the ceiling and continuing the large cabinet crown around the room, tied the entire L-shaped room together and made it fit into the rest of the homeowners style as you can see the dining area already had that same ceiling crown treatment. 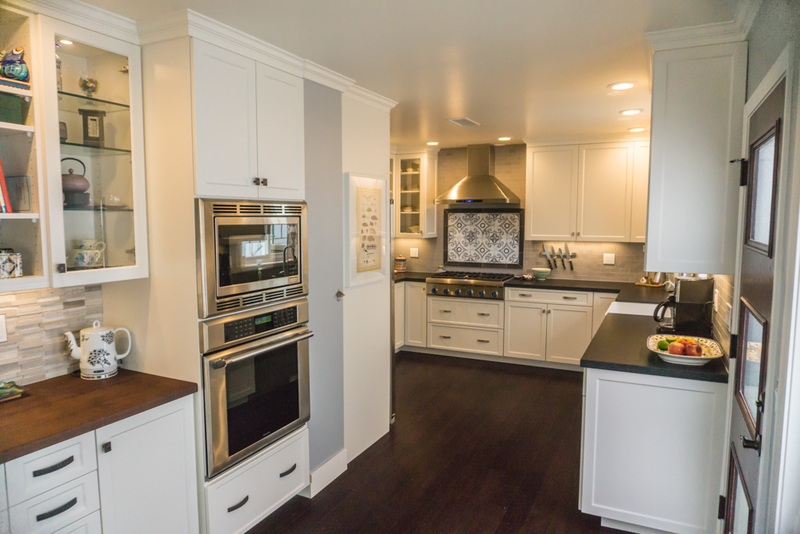 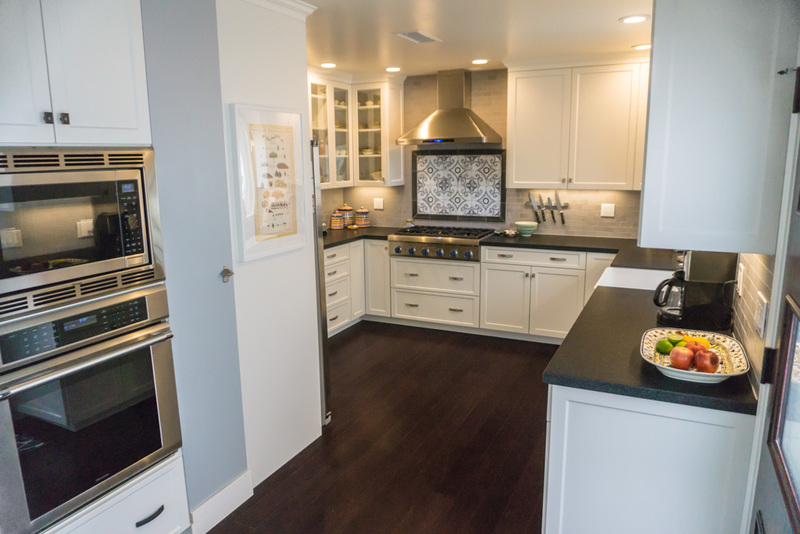 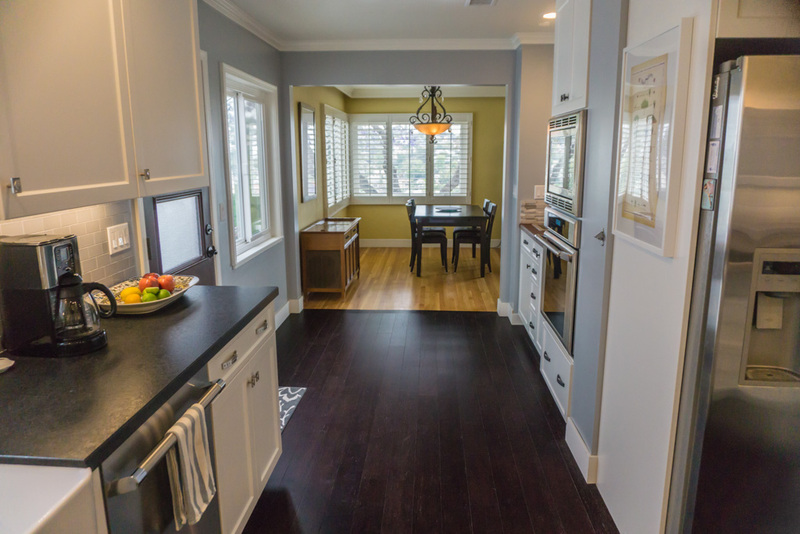 The new kitchen flooring is a very dark prefinished bamboo plank which is a great neutral base that makes the rest of the kitchen stand out, and is a good contrast to the rest of the homes original oak wood floors. 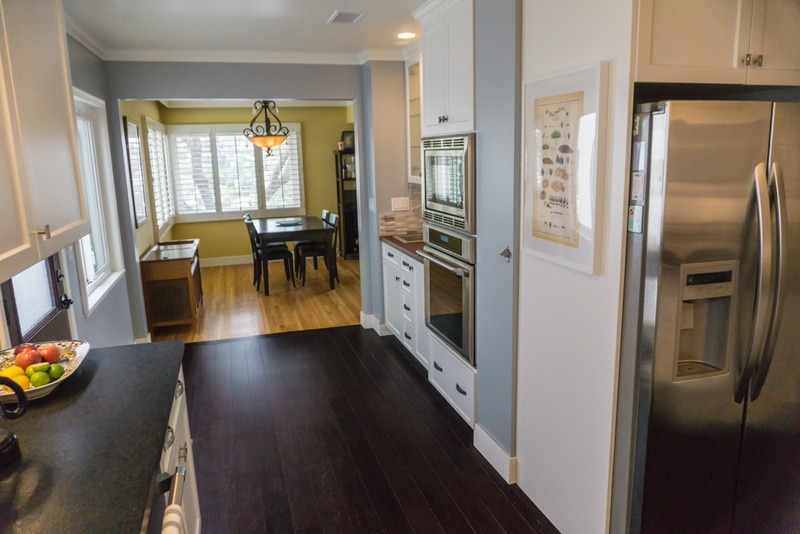 This new bamboo floor is also the densest and hardest natural wood floor product available and is well suited to the abuse it will receive in the kitchen.